Chillisauce.com specialises in corporate events, activity weekends and hen and stag parties, sending more than 140,000 Britons on a whole variety of activities around the world each year. We began working with Chillisauce in December 2013 to assist in raising media and consumer awareness of the brand during its peak sales period, to integrate with the site's ongoing SEO strategy, as well as associate the brand with a globally renowned event. Chillisauce managed to get hold of two participant spaces for the Naked Sledding World Championship 2014 in Germany - the event took place on the 15th February 2014, with the location changing at the last minute (due to lack of snow, of all things) from Braunlage to Cochstedt Airport in the smaller town of Lower Saxony. 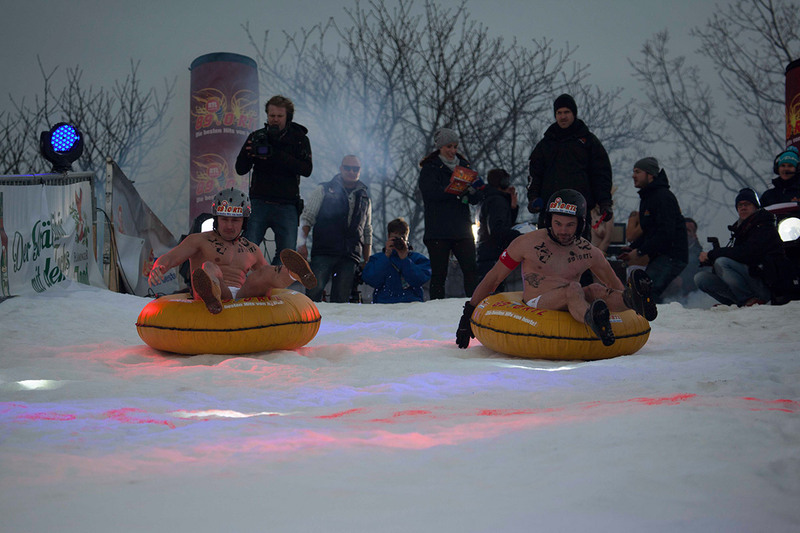 2014 was the first year that Great Britain was going to be represented in the Naked Sledding World Championship, therefore the media hook was instantly there and this is what we used to drive the PR campaign and reach the targets set out to us. "The Naked Sledding project was a well-organised, integrated campaign that delivered extraordinary results. Our best campaign to date"
Our expertise in consumer PR enabled us to identify that this type of campaign was well suited to BuzzFeed, so, using our pre-existing media relationships, we invited a member of the team along to Germany, all expenses paid. We also approached the men's lifestyle press, as Chillisuace's largest target market is men aged 20+ who are looking to organise a stag event. With this in mind, we approached The Sun to be the exclusive UK national newspaper partner for Chillisauce and the Naked Sledding World Championship (on a completely non-commercial basis). This particular campaign for Chillisauce secured well over one hundred pieces of media coverage, reaching more than 445,000,000 people worldwide. Highlights included ABC News, Metro, BuzzFeed, Yahoo!, Daily Mirror, The Sun, Daily Star, Daily Telegraph, Huffington Post, Event Magazine, The Sunday Times, Maxim, Fiesta, Love It! and many, many more! The competition launch video, created by the 10 Yetis in-house production crew, has so far had a total of 52,756 views on YouTube, and the post-event video created by Chillisauce's own team has so far received a total of 82,341 views on YouTube - a combined total of 135,097 views. "I've worked with hundreds of specialists over the years and rarely come across people as hardworking and exceptional as the PR team at 10 Yetis. We needed help launching the first ever British team for the naked sledding world championship and this was the perfect excuse to work with them. We've followed and admired 10 Yetis Digtial work for years and they didn't disappoint."